Return to Asia (part 3: Seoul again) – record of m.
We were heading back to Seoul later in the day, so we didn’t plan much to do. We all met up fairly early in the morning and had breakfast at the hotel restaurant. Virginia’s father then went back upstairs to rest, so Virginia and I decided to walk to the Teddy Bear Museum so we could buy gifts for our three nieces. Fortunately, we were able to walk along Bomun Lake and stay away from the main roads. Less fortunately, we couldn’t quite figure out how to access the museum once we got to where Google Maps told us to go. We ended up walking around one building into a seemingly different complex that included a convention hall, school, and the museum. We then looked for the museum shop entrance, because surely they would want people to be able to easily go inside and spend money? Nope. We looked for an entrance, found nothing, and went back to the museum ticket desk. Thankfully, the person behind the desk agreed to walk us into the museum exit and take us down to the shop. Look – we found the entrance to the Teddy Bear Museum! 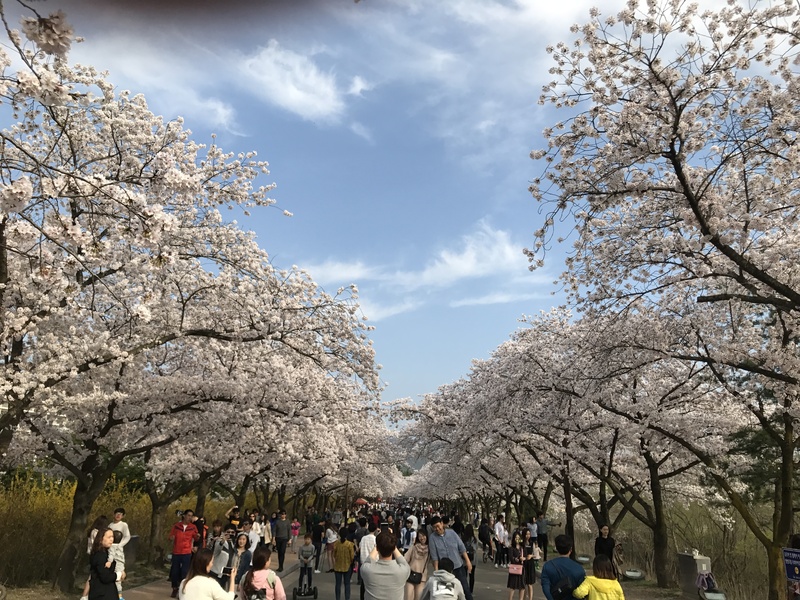 So glad we were there during cherry blossom season. The high-speed train back to Seoul was easy and uneventful. I’m grateful to Virginia’s father for the tickets — we were all comfortable and could work or read during the two-hour trip. After arriving at Seoul Station, we took a taxi back to Virginia’s father’s apartment to unload our bags and then walked out for dinner. Virginia’s father recommended a restaurant specializing in grilled kalbi, though he kept telling us how sparsely decorated it was. We took a bottle of wine and had an amazing meal. We ate far too much and then got more to take home. Mirroring our first morning, we breakfasted in the apartment on eggs, toast with jelly and cream cheese, and coffee. We talked about perhaps walking outside, but ended up staying in and reading. We heated up the take-away kalbi from the previous night, made rice, and had both with kim chi and gim (seaweed snack). After lunch, we took the train to Gimpo airport. We bade Virginia’s father farewell and started the short trip to Tokyo. The two-hour flight was mostly uneventful, as was the train ride from Haneda airport to the Hotel ANA Intercontinental. We did arrive later than expected, though, and had made no plans. I was feeling self-indulgent, so I suggested the two-Michelin-starred Pierre Gagnaire restaurant on the top floor of the hotel. Virginia, equally indulgent, agreed to do it. OH MY GOD. We each ordered two courses, not fully comprehending that a “course” came on five or more plates. That is a lot of food. We paired them with two glasses of Billecart Salmon Brut Rose and a bottle of 2005 Faiveley Corton grand cru Burgundy. By the end, we felt like we had to roll ourselves into bed. We’d need to walk a lot the next day. Pingback: Return to Asia (part 4: Tokyo) | record of m.